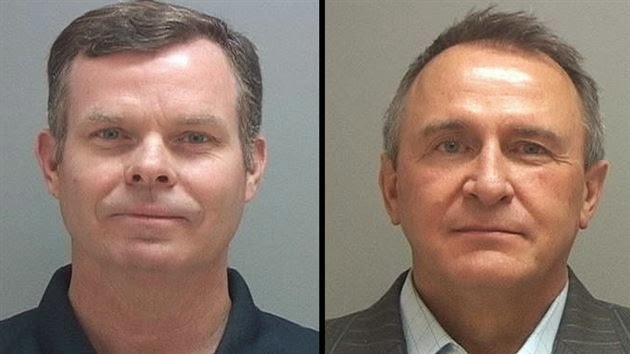 Today's Mug Shots: Shurtleff, on right, looks like a deer in the headlights. Swallow, on left, looks like a smart a**. It was a shocking day for the State of Utah when the last two State Attorneys General were arrested at their homes with an 8 a.m. knock on each door. We tried to watch the news conference to explain the charges from the Salt Lake County Attorney. Our antiquated government computers couldn't quite handle the live-stream. This is a sad situation all around. I do believe it is partly a result of one-party dominance in state politics. People vote straight party and do not pay attention to the candidates. There were people out there including some moderate Republican friends who were concerned that all was not well in certain political circles, at least before the last election round in 2012. It is also disturbing to attorneys in government service. I was pleased to learn that I was not the only one shaken. Another attorney mentioned how they hoped their mistakes were never discovered like the inadvertent email deleted that probably should have been saved as a federal record. But that's a far cry from charges of bribery, evidence tampering, obstruction of justice, illegal campaign funds, deals with known criminals, profiting from public office, etc. These charges strike at the reputation of all attorneys and public servants. We are not well-appreciated in general because nobody likes the school hall monitors (I did like doing that back in the day). There is a segment of the public that believe all attorneys and all public servants are guilty of similar bad behavior. We even worry ourselves that someone could come after us for some mistake or politically motivated charge (which seems to be the principal Shurtleff/Swallow argument in defense right now). There were two times, so far, in my federal career. The first was when I was sued in my personal capacity as part of an alleged conspiracy to obstruct the Wild Horse and Burro Act. I didn't even blink but chuckled as I passed it on to my boss who passed it to the US Attorney who got it thrown out as there was no basis in law and fact for the suit. The second time was when I was falsely accused of wrongdoing in some personnel complaints. Bad managers* in the W. administration shoved me out of my supervisory job and transferred me for which I am almost to the point I can forgive them. I was able to keep sufficient wits about me to have them throw me into the briar patch of Utah. It's turned out well for my family. One of the remaining mysteries is why the US Attorneys Office stopped its investigation and potential prosecution. Shurtleff argues that vindicates him on the theory that the feds saw they could not convict. I have some reason to believe that this was a Washington DOJ decision not to stir up more political trouble in the state of Utah. There are enough ongoing lawsuits between Utah and the feds (roads on public lands, Indian jurisdiction issues, challenges to ownership of the public lands, fights about the Constitutionality of Obamacare, etc.) The Holder DOJ did not want to appear that it was persecuting Utah Republicans in its prosecutions. There is some over-caution in that regard in the Obama Administration. So, it was left to local county attorneys, their investigators, a somewhat reluctant state legislature investigation (I'm on to you, Ken Ivory), and, oh yeah, the FBI didn't give up in spite of whatever happened with the US Attorney. The accused are, of course, innocent until proven guilty. And there may be serious issues in seating an unbiased jury and in other technical aspects of prosecution. As for the evidence, uh, it's on tape and in receipts and emails already in the public domain. Each revelation that comes out is more embarrassing and serves to pile on the compelling evidence against these two - and a few more of their associates. More charges and bookings may yet come. It is very, very sad. * I was vindicated in two senses. First, the decision-maker was caught up in the Abramoff scandal and her husband ended up in jail. Second, it took another ten years for the managers who followed me in my old job to resolve the personnel problems remaining in the office that I had nothing to do with. The problem wasn't me.